The fronts of the revolution are many and overlapping, from patriarchy to Arab chauvinism. Despite harsh conditions, mass participation in the revolutionary process is still ongoing. In the northeastern part of Syria, populated by a majority of Kurds, recent battles between Islamists and Kurdish militias from the PYD (linked to the PKK) has led to the emergence of many popular initiatives from the activists and the local population. Those popular initiatives aimed to show the brotherhood of Kurds and Arabs in this region, and to reaffirm that the popular Syrian revolution is for all, and that it condemns racism and sectarianism. During those battles in the Raqqa province, the city of Tell Abyad has seen the creation of the “Chirko Ayoubi” brigade, which joined the Kurdish Front brigade on July 22, 2013. This brigade now combines Arabs and Kurds together. They have published a common declaration denouncing the violations committed by Islamist groups and the attempts at dividing the Syrian people in its ethnic and sectarian basis. Unfortunately some other FSA forces have fought on the side of the Islamists. In the city of Aleppo, in the Achrafieh neighbourhood – mostly populated by Kurds – a protest was organized on August 1, 2013, gathering many hundreds of people who support brotherhood between Arabs and Kurds, and condemn the acts committed by islamist extremist groups against the Kurdish population, chanting together for the unity of the Syrian people. In the city of Tell Abyad, which has suffered from heavy fighting, activists have tried to organize many initiatives aimed at ending armed fighting between the two groups, and stopping the forced expulsion of civilians. They want to put in place a people’s committee to govern and manage the city and to promote collaborative initiatives and actions between Arab and Kurdish populations, to reach a consensus through pacific means. The efforts are ongoing despite the continuous battle between Islamist and Kurdish militias. In the city of Amouda, around thirty activists met on August 5, 2013 with Kurdish and Syrian revolutionary flags behind a poster saying “I love you Homs,” to show their solidarity with this city, besieged by the Syrian regime’s army. Recently again, in the city of Quamishli – where Arab populations (Muslim and Christian), Kurds and Assyrians live – local activists have organized numerous projects to ensure coexistence and the administration of certain neighbourhoods by joint committees. In the same city, the branch of the Free Kurdish Student Union has started a small internet campaign calling for freedom, peace and brotherhood, tolerance and equality for the future of Syria. One of the active women in the group in Salamiah said: “We participated in the funeral processions of our martyrs, although generally the entrance of women in cemeteries is not a customary practice in our city. But we wanted to break archaic customs, including this one. Each of us considered the martyr as a son, brother or father. Any martyr is the son of the city and not just of his family”. While Ahlam, another female revolutionary, says: “We categorically reject all phenomena foreign to our society and want to see removed both foreign agendas and agendas far distant from the aspirations of the Syrian people, acting under different names and in an extremist form that only serves the regime, giving the latter arguments to hit out at the revolution and to terrorize the population.” She continues: ”As a group of women, we believe that the establishment of a free and modern state cannot be achieved without the existence of citizenship. It is our responsibility today to prepare a new phase in the life of Syrian women, so that a woman can expect to enjoy the full rights of citizenship in a new society. Our revolution is not only a revolution against a corrupt regime and archaic and obsolete laws that do not guarantee justice to women. It is also a revolution against all the customs and the lores that have held women back, preventing them from full and effective participation in the construction of the state and society. Thus, the popular committees and the organizations play a crucial role in the pursuit of the revolutionary process, because these people are essential actors who enable the people’s movement to resist. It is not about diminishing the role played by the armed resistance; but the latter depend on the popular movements to continue its fight. Without this, we would not stand a chance. A banner crafted by the revolutionary city of Kafranbel sums up very well the spirit of the Syrian revolution, “enemies are many … the revolution is one… and continues”. Yes the revolution continues, despite the difficulties and multiple dangers. The Syrian people continues its path towards freedom and dignity, sweeping away all its oppressors. We have for example seen the youth in the city of Deir Attyah self-organizing to clean their streets in a campaign called “cleaning Deir Attyah to bring it back more beautifull”, and the youth of Daraya launching a campaign a few weeks ago to ask for the end of the siege in their area. 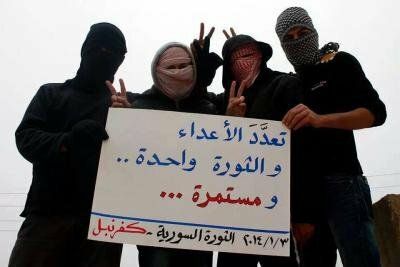 Popular activism in the Syrian revolutionary process is still, as we have shown here, very much alive.